Paul currently serves as assistant athletic trainer for the University of Southern California, with primary responsibilities in football. In 1998 he earned a bachelors of science degree in Kinesiology from Cal Poly Pomona, then in 2000 earned a masters of arts degree in Human Performance from San Jose State. Prior to working for USC, Diaz worked at Northwestern, working primarily with the football program with oversight responsibilities of the men's and women's tennis teams and wrestling team. Catherine Hill currently resides in Los Angeles, CA where she has worked as an athletic trainer for the University of Southern California since 2007. Originally from Chicago, IL Catherine went to North Central College earning Bachelor's degrees in Athletic Training and Psychology while working as a student athletic trainer with the college's sports teams. She was certified in 2004 and worked as an intern at Northwestern University for 1 year with the Men's Soccer and Women's Lacrosse teams before heading to graduate school. In 2007 she earned a Masters' degree in Kinesiology and Health Promotion with an emphasis in Athletic Training and headed to California for her current job. Catherine has worked Summer and Winter X-Games events since 2008. She enjoys experiencing new things in life especially music and sports. Sarah Newman, MA, ATC currently resides in San Diego, CA and works as an Athletic Trainer for the United States Navy. She works both Summer and Winter X Games for Medicine in Motion. Sarah is a Wisconsin native where she solidified her love for cold weather and the Green Bay Packers. Sarah then attended Central College in Pella, IA, where she was a collegiate athlete playing softball, soccer and basketball while receiving her Bachelor's Degree in Exercise Science/Athletic Training in 2001. While at Central College, Sarah worked with the football, soccer and basketball teams as a student athletic trainer, as well as studying abroad in Carmarthen Wales and working with their rugby team, where she discovered her passion for 'non-conventional' sports. Certified as an Athletic Trainer in 2001, Sarah obtained her Master's degree from Western Michigan University in 2003 and began her career working for the United States Olympic Committee as a two-year Fellow, and later as the Head Athletic Trainer for the US National Short Track Speedskating Team through 2009. Sarah has worked both Summer and Winter X Games for Medicine in Motion since 2010. Sarah enjoys fly-fishing, body boarding, surfing, playing her guitar, camping and backpacking. Camp Woodward is where Cris' passion for medicine and alternative sports combined and blossomed. This work inspired Cris to attend San Jose State University to earn a Master's degree in Kinesiology in 2003. At the same time worked as a Graduate Assistant at Stanford University for the men's football gymnastics teams. Since completing his education, Cris has been involved in many different arenas of Sports Medicine including high school, college, military, clinic, and administration. Cris has a strong passion for the field of sports medicine and believes that it is imperative to continue growing as a professional. Cris is an outdoors enthusiast and loves skiing, snowboarding, backpacking, and golfing and even just walking his bulldog around Long Beach. John plays a key role in the Action Sports’ world and in California RampWorks as one of the lead masterminds behind event creations and ramp structures world wide. Also known as "JT", John grew up in San Diego, giving him exposure to an array of action sports. He has been passionately involved in the action sports industry for over 22 years. Beginning in the Early 90’s, when there were very few places to skate or ride, JT took his building skills and abilities to erect and make possible, a majority of skating ramps and obstacles for the time; jumping at any chance he got to aide in a ramp build. Before long, JT had made a name for himself and his craftsmanship; individuals, companies, and professional athletes began calling to have ramps and equipment built. By the time JT was 18, he was traveling the world, skill saw in tow. JT has a true passion for building the unbelievable, and has always been the guy to execute a design and build. Included amongst his list of credits for ideas, designs, and creations is being a builder of the X Games (since the beginning), and the mastermind behind Danny Way's Great Wall of China Jump. John shares a true passion for the energy and excitement people experience when the unbelievable becomes reality. JT prides himself and his team at CRW in the commitment-understanding-designing and creation of the most impressive action sports ramps and structures in the world. Rum has been with Cal Poly Pomona since August of 2000 and was promoted to his current position as Head Athletic Trainer in June of 2002. 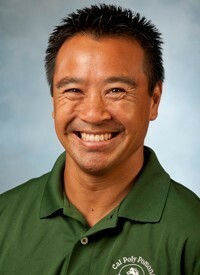 Prior to his current stint at Cal Poly Pomona, Malasarn was a graduate assistant at Fresno State from 1998 through 2000. In 2001, Malasarn published an article on the characteristics of successful athletic training in the Journal of Athletic Training. He also spoke on the same topic at the National Athletic Trainers Clinical Symposium in Los Angeles. Rum did his undergraduate work at Cal Poly Pomona and received a bachelors degree in Kinesiology with a minor in communications in 1997. That same year he earned certification from the National Athletic Trainers Association. In 2000 he earned a Masters degree from Fresno State and was certified as a strength and conditioning specialist in 2001. Malasarn has worked on the medical staff covering the X Games since 2001. In his free time, Malasarn enjoys surfing and coaching youth sports. He resides in Arcadia with his wife, Maria Sansui, and son Dylan. Maria is a health and physical education teacher at Glendale High School.